Welcome to this year’s Mabon tarot blog hop! 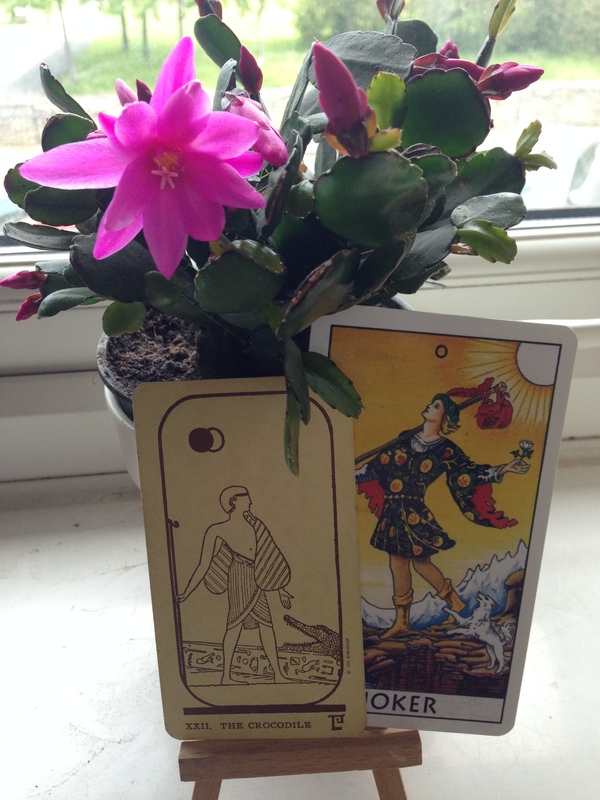 Our wrangler Boglarka Kiss has asked us to write about what a specific tarot character would prepare for this occasion of celebrating harvest and abundance. Surprise surprise, I chose the Queen of Pentacles. Why? Because it would be my significator if I ever used one. No rocket science until now. But! 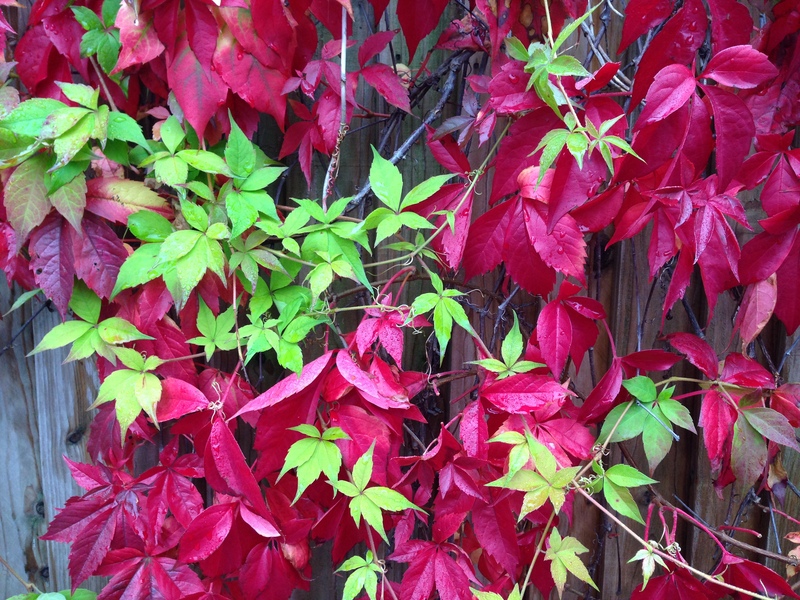 This year, the Hindu festival of Navaratri coincides with Mabon. Navaratri means ‘nine nights’, and is meant to worship and celebrate the Goddess Durga and her nine forms. It starts on 21/09/2017 this year, so here we have Mabon and Navratri at the same time. Great! I am sure all the hop posts will be full of delicious pumpkin recipes (YUM! ), so I thought to use this lucky coincidence to show you what people eat in India on this day! Food for Indians is sacred. Whatever the date is, even if there’s no festival going on (that’s a very rare occasion!) food has to be prepared in a certain manner, only then will the consumer lick their fingers and ask for more while still having some on their plate. Short history lesson: spice blends like Garam Masala were created by priests/nutritionists not only to taste awesome but to aid people’s health as well. For example, Garam Masala has black peppers, coriander seeds, cloves, bay leaves, cinnamon, mace, black and green cardamom, cumin seeds and dry red chilies. You dry roast these and grind them in a blender. Some of this masala’s health benefits according to Ayurveda are aiding weight loss, lowering blood pressure and boosting the immune system. When you make it be sure to open all windows and send the kids out to play because man it will sting your eyes! So, what do people eat on the holy occasion of Navaratri? For most of the day nothing, as you are supposed to be fasting, but when you finished your evening worship you can go and break your fast and oh was it worth the wait! Here I list some mouthwatering foods that all have one ingredient in common, that is easily available in the UK and around the world. It is nice and round, just like a Pentacle (Queen of Pentacles, remember?) Have you guessed it? Yes, the disgusting sticky pudding thing, tapioca! And let me tell you, it is only disgusting because you have been making it wrong all this time! So now listen because here I present you the Queen of Pentacles’ list of dishes she prepares for Strength (Goddess Durga). 1. The Starter: Sabudana Pakora – Tapioca fritters made with mashed potatoes and roasted peanuts, served with chutneys. If you want to avoid deep fried things, try Sabudana Thalipeet instead! Eating tapioca is good for your bones, your brain, your insides, good for muscle growth, for aiding healthy growth of fetuses, and boosts milk production for breast feeding women. It is high in fiber, minerals and vitamins. The only thing is, if you want to lose weight, this should be a food that makes it to your table very rarely. I hope I have changed your mind about tapioca, and inspired you to try some new recipes this year! Have a happy Mabon, and Hail the Goddess! 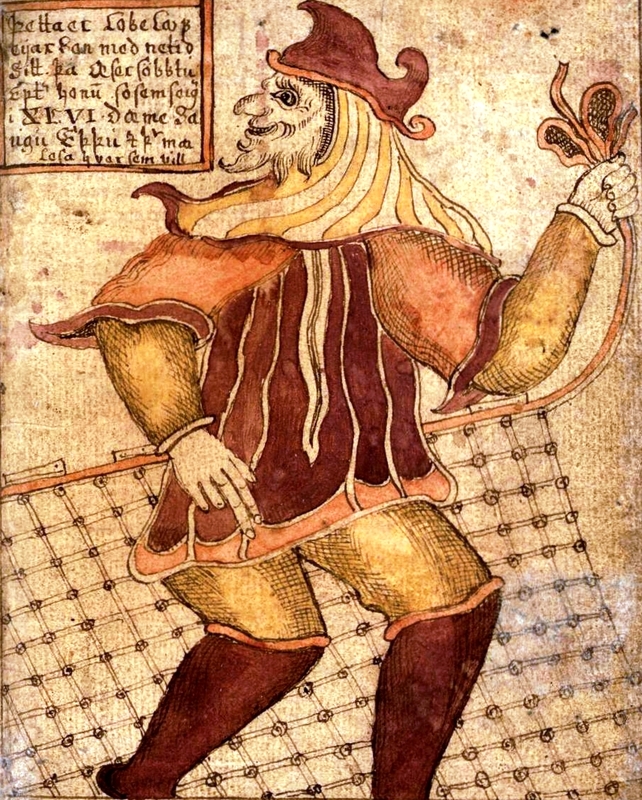 The Fool. Supposed to represent all who have started their journey with the tarot, or actually anyone who have started anything new. It represents us humans, starting off as innocent, ignorant babies, treading the path of all the Major Arcana cards in life. For a very long time this was one of my “problem cards”. Why? Because the first time I met him was when I opened my first ever tarot deck (The Ancient Egyptian Tarot, still my favorite working deck), and started reading the meanings of the cards. Under the Fool, you get these lines: “This Arcane, XXII., means that a number of misfortunes are threatening you, and that your only hope is to come to you from Heaven towards which your prayers must rise constantly.” Not a very positive meaning. On the picture you see a man walking towards a crocodile, without noticing the danger. Not exactly a card by which I would want to be described as a beginner reader. But then, this is why you have to constantly read, learn, improve and ask questions. Luckily my mom had a book on a bunch of different fortune telling systems, and there I have read the “standard” meaning of this little bugger, which is the one with being ignorant and stuff like that. As a beginner, I got confused and decided to stick to whatever was written in the little booklet that came with my cards. Only years later could I accept that there could be other meanings to the Fool, proving that indeed the beginner reader has to be described by him. Oh the shame, the shattered ego…. Since then, I came to a sort of ceasefire with him. Now I want to be the Fool, open to all opportunities and options, but still there is a thorn in me because of the first experience. As it was a difficult card for me, I was thinking about it a lot. Over time, I have found some characters with whom I can make myself accept and even like the figure of the Fool. I will show you three of them: the Youngest Son, Ganesha and Loki. Three completely different characters from three completely different cultures. I love them all the same. Let’s start with The Youngest Son. 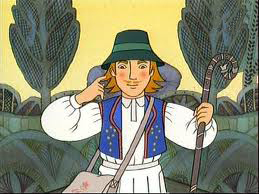 In Hungarian folk tales (actually almost in every nation’s folktales) it is always the youngest son of the king or the poor man, who will at the end overcome all difficulties, save the princess and live happily ever after. How is he related to the Fool? Before it’s The End, he has to go on a long and dangerous journey. He has to outwit witches (The Magician), meet the other country’s king (The Emperor), slay the Dragon (The Devil), come back from the dead -as sometimes he gets killed by his own brothers- (Moon, Tower, Death), claim his rightful prize and punish the wicked brothers (Justice), marry the princess (Lovers, Sun, Star) and live happily ever after (The World). If I would think about it I am sure I could fit all the Major Arcana cards in these tales. 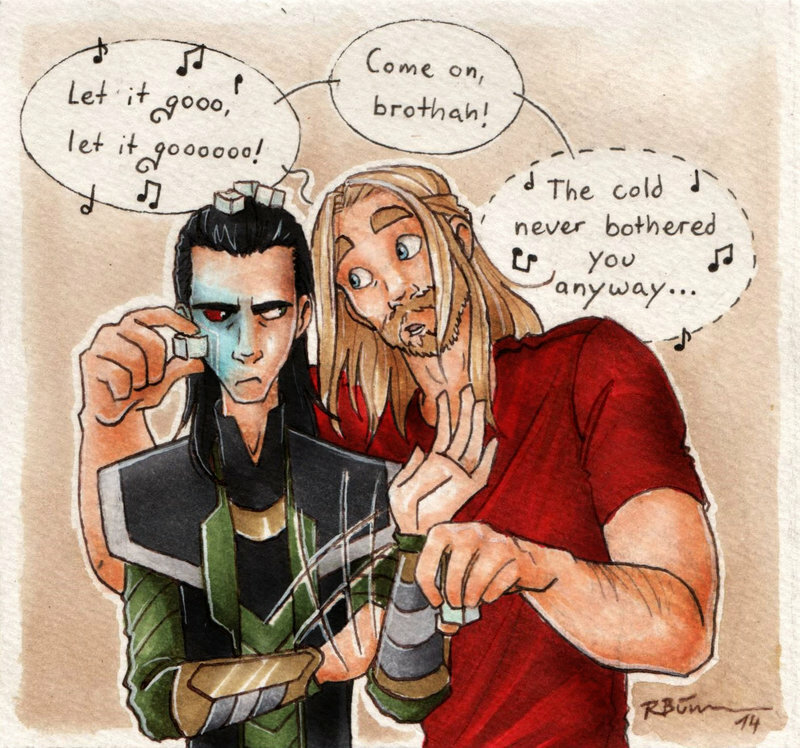 So I’m talking about the Scandinavian trickster Loki. He is the Fool in many ways (*concentrating on NOT starting to tell his whole life story*). He is born to Giant parents, but is considered (up to a degree) to be one of the gods. Just like the Fool, he doesn’t belong anywhere, he is a separate category on his own. He is continuously on the move, just can’t sit down peacefully. He always gets into trouble, but always finds a way out too (well, most of the time). I was thinking of making a tarot deck of my own, and as hard as I tried, I couldn’t fit him in any other Major Arcana card. He just has to be the somewhat innocent, playful, unthinking silly Fool. I have to stop writing about him otherwise I will go astray again. 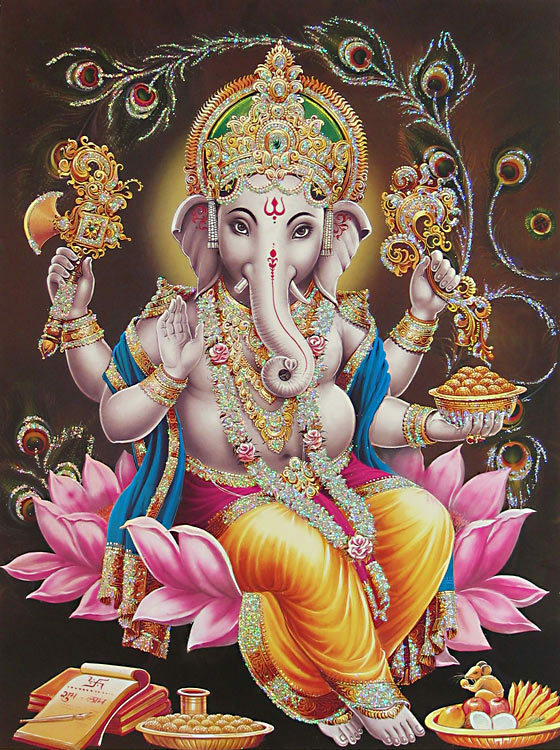 The third one is the Hindu god Ganesha. Although in his established status he is more likely to be the Hierophant or even the World, Ganesha’s story also starts as the Fool. 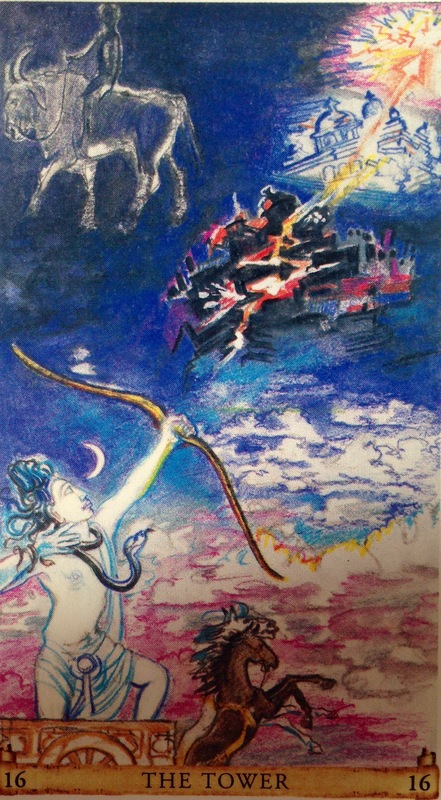 In a nutshell, he was created by Parvati, wife of the god Shiva. Parvati wanted to soak in a nice hot bath and have some “me time”, but her husband never let her be alone. So, she created Ganesha, who had a normal, human head that time. She told him that he is not to let ANYONE in the bath chamber. 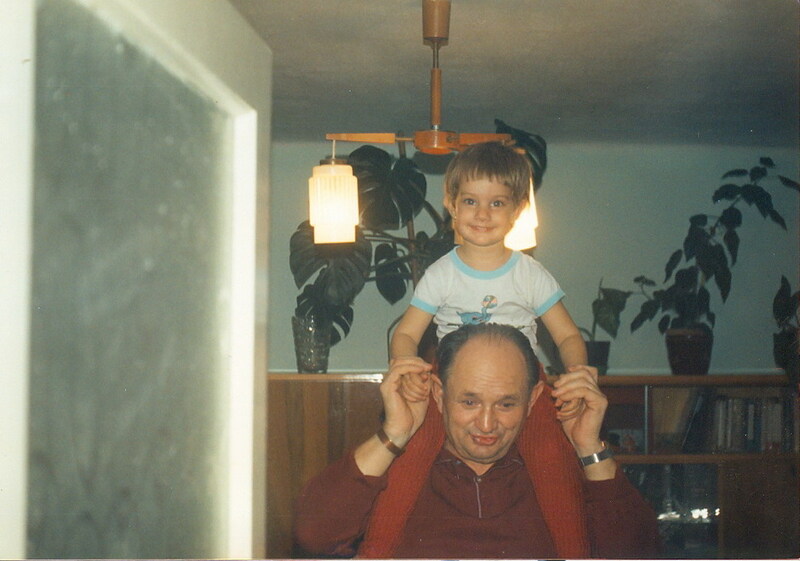 As a newborn, he was innocent and without knowledge of how the things were run around there. You can see why he was the Fool at it’s best. So, he was standing guard at the door, when Shiva arrived. He of course wanted to go inside, but Ganesha didn’t let him. After trying to explain Ganesha that he is not just anyone, but he is the husband of Parvati, Shiva got angry, and beheaded the boy. 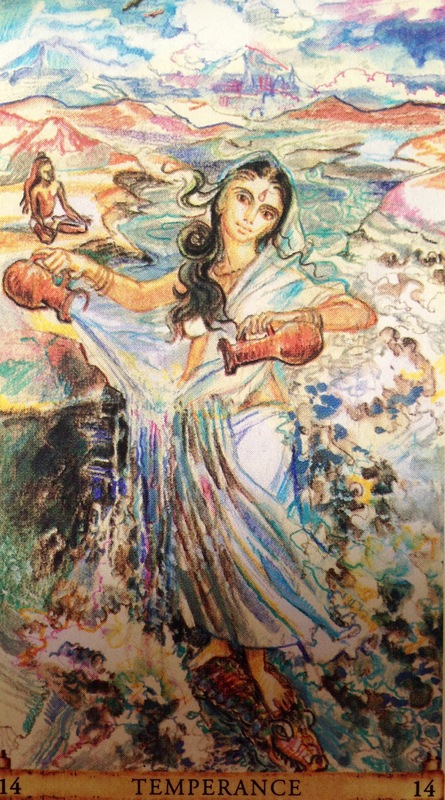 Parvati came out of the bath and demanded that Shiva restored Ganesha into life. That was somewhat difficult, because Shiva hit him so hard, the boy’s head got lost in space. After some troubles they finally have put an Elephant’s head on his shoulders, and voila! Ganesha the wise and kind was created. 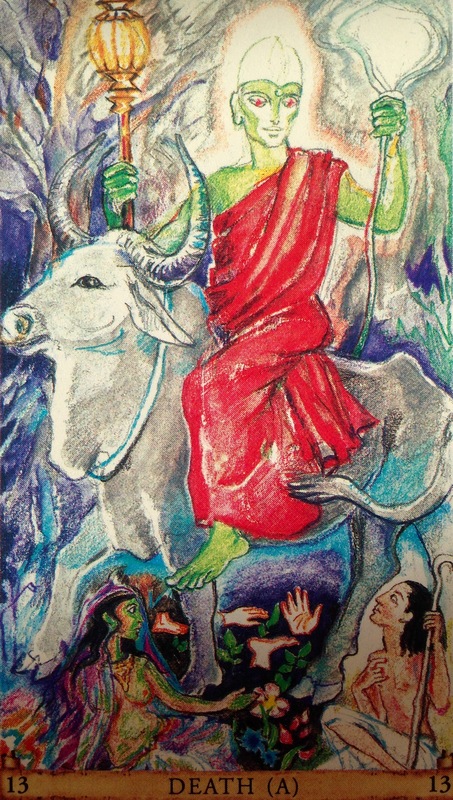 From that time on he is considered to be Shiva’s son and he is to be revered first in every ritual performed in Hindu traditions. 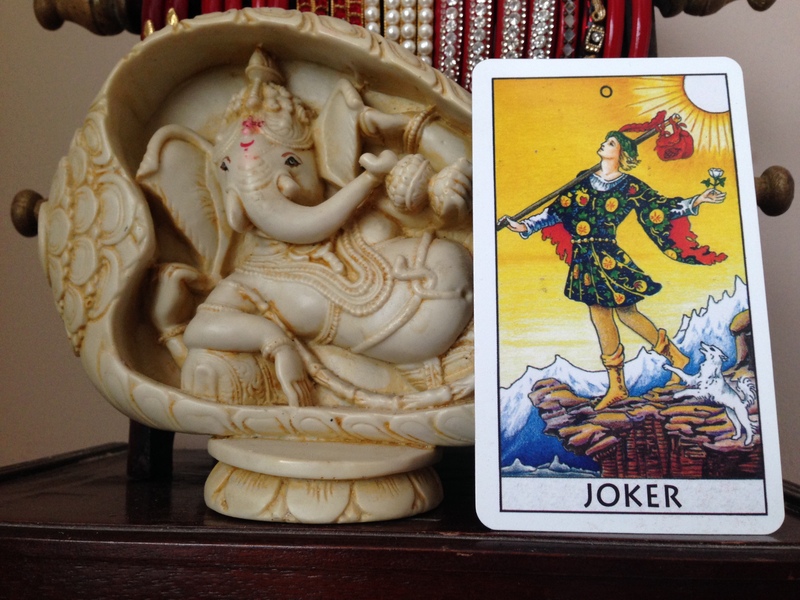 As you can see, it was a LONG journey for me to accept and start to like the card of the Fool. But, as it is so important with all the other cards too, associations helped me in beating my dislike for him. 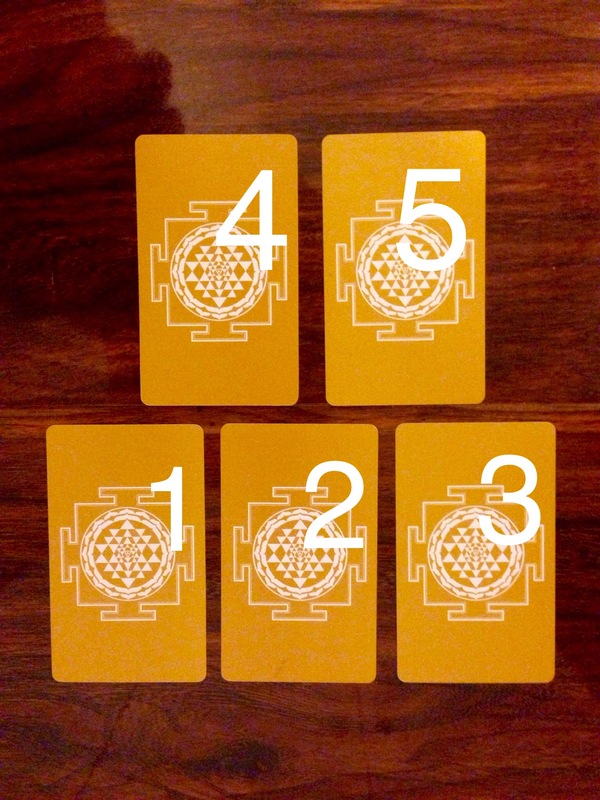 I hope this short summary helps every beginner reader to find their ways in accepting the problematic cards in tarot. After all, you all have to work together if you want to join in the journey of the Fool.